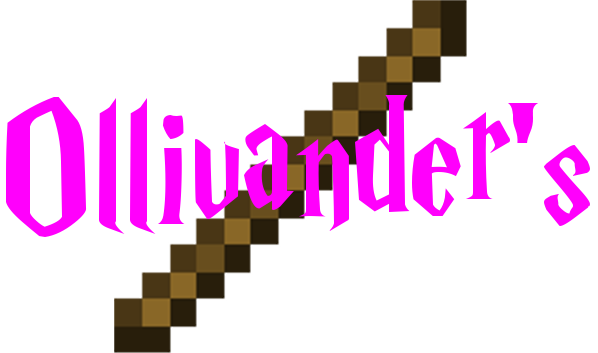 Ollivander's is a Harry Potter plugin that strives to provide the most faithful to canon experience possible in Minecraft. I also do the twitter: @cakenggt. Check it out to get updates on new features and releases. Spells are cast by first speaking the spell incantation in normal chat with a wand in your hand. This is the in-canon incantation, so your Harry Potter fanaticism can finally be rewarded. You do not have to be taught the spell or have read a spellbook with the incantation in it to cast the spell. After speaking the incantation, left clicking with the wand still in your hand will cast the spell, which takes the form of a rapidly moving ball of particle effects. Hitting living entities requires aiming for their eyes. Note: During this beta testing, all of the currently implemented spells can be found in the DEBUG book given by the /Okit command. The more times you have cast a spell, the more powerful it will become. If you have over 100 casts of a spell, then the spell is saved in your memory for nonverbal casting. Simply left click again and you can cast the spell as many times as you want. You can scroll forward through the spells you have mastered nonverbally by right clicking with the wand in your hand. Sneak and right click to scroll backwards. Also possible is wandless spellcasting, although its results are fickle at best. By speaking a spell incantation and left clicking, you have a small chance to cast the spell you desire. This chance scales up with your previous successful uses of the spell. Even when you successfully cast the spell, your wandless casting will render the spell with 1/10 it's normal power. The creation of wands is a highly guarded secret, the information on which is stored in a book given to server ops with the /Okit command. There are 16 different types of wands using 4 woods and 4 cores. Each player has a destined wand type. You can see if a wand is your destined type by right clicking while holding it. If it is your destined type, then you will hear the level-up sound and a particle effect will play. Casting spells using a wand not of your destined type will half the effectiveness of the spell. The first time you cast a spell with a wand, the wand will ally itself to you. This can only be changed by losing your wand to a disarming spell. By writing down the incantation of a spell in a book and signing it, your experience with that spell can be passed down to others. Your current uses of the spell are saved with the book, and anyone who reads it will get a boost of their uses of the spell by half the difference between the amount in the book and their current amount. Through the /kit command, a server op has access to many pre-written spell books included in this plugin. These spell books explain the effects and usage of the various spells. Every spell in the plugin is mentioned in these books, and a small amount of experience with the spells is gained by reading the book. You do not need to be taught a spell or have read a book with an incantation in it to use that incantation. Reading a book just helps give you a little more experience with the spell. Note: During this beta testing, the experience gained from the DEBUG book is 200 castings. All other books given by Okit give 20. Like the owl post in the Harry Potter series, cats can now be used in minecraft to send an item to another player. In order to utilize this, your recipient must be online and in the same world as you. Find a tamed cat and lay an item at it’s feet, within 2 meters. Then, while standing no further than 10 meters away, say “deliver to PlayerName”, where PlayerName is replaced with the recipient’s name, which is case sensitive. If the delivery was successful, you will hear a meow and the cat will disappear. If the delivery was unsuccessful for any reason, the cat will hiss. The config.yml has a node called zones. With this you can define where certain spells can and cannot be cast. In the default config.yml, this plugin will be active on all worlds. Check the configuration page to find out more on how the configuration works. /Okit - This command is only runnable by server ops. This gives the kit of all possible types of wands, all pre-written spellbooks, and the Deathly Hallows. Optionally this command can have one or two arguments. The first argument can either be "wands" or "books". This will give you only the wands in the plugin or only the books in the plugin. The second argument can be an integer, specifying how many copies of the wands or books you want. "/Okit wands" will give you only the wands in the plugin. "/Okit books 10" will give you 10 copies of each book in the plugin. See the command page for how to use it in detail. Using a horrific incantation, you can create a horcrux. Normally, upon death, all of your spell experience is wiped out. However, the creation of a horcrux will teleport you to that location on your death, with your spell experience still intact. However, with every horcrux you create, your maximum health is halved. The details on this spell can be found in the book "Secrets of the Darkest Art". Players can divine the future through peering into a crystal ball. By default, peering into a glass block while sneaking for an extended period of time will reveal a prophecy to you. Prophecies will detail long term effects that will happen to you at a specified time in the future for a specified duration. You have a chance to get any potion effect as a prophecy, but remember that only 60% of the potion effects are positive in nature. More details can be found in the book "Unfogging the Future". The Elder Wand is distinguished by being a blaze rod instead of a stick, with a core of Ender Pearl. If the Elder Wand is allied to you, any spell you cast with it will be twice as strong. If it is not allied to you, then spells cast with it will be as strong as if they were cast using a wand of your destined type allied to you. The Cloak of Invisibility is a chainmail chestplate with the lore "Silvery Transparent Cloak". Wearing this cloak will hide you from all other players. It will also prevent mobs from targeting you, however, mobs that have already targeted you will continue chasing you until you hit them with something. This plugin uses a chat dropoff system to prevent console spam from people practicing their spellcasting. Any players within 50 meters of you will hear you casting spells, but players further away than that won't receive the chat message. This does not affect normal non-incantation speech. Each spell has a permissions node called Ollivanders.SPELL_NAME and this permission node can be set to false to disable use of that spell. By default, if the permissions node does not exist, players can use the spell. Submit your server to see it featured on this list! Please report all bugs with the ticket system. You can disable the stat collection via /plugins/PluginMetrics/config.yml if you wish. As of version 0.11 this plugin comes with an updater that will automatically update it to the newest version on restart. The updater can be disabled in the Ollivanders config by setting "update" to false. how to active the nodo? I am getting exactly the same spam message, console is just spamming it. Idk but some players have been complaining about having to type and would rather just click the wand. Thanks! Id gladly pay if such a plugin would be available. I recommended Harry Potter Spell on spigot as it more up to date while this hasnt been updated or worked on in ages. It was good but it interfered with other plugins. Would the 1.7.9 version work on a 1.8 server specifically? Is there a cool down? PLEase help I need this plugin for my server!!!!!!!!!!!!! Please implement a cool down system between spells!!!!! Is there a way to have a cool down on spells? Or something to stop players from spamming spells, but they can still use it? If not can someone make that? The reason why some spells aren't working is probably because you have book learning as true in the config. That means to use a spell at all, you must have read a book with that spells experience in it. I can't download this on my minecraft mac server please help me thank you. I've got a server aswell if anyone would like to join. It's purely vanilla, except that we're using this plugin. So it's kinda like a magic survival server I guess. First of all, this plugin is AMAZING and is PERFECT for my server. However, the custom crafting recipes aren't working, such as Floo Powder and Broomsticks. Please fix this! it's because you downloaded someone else's map and tried to pass it off as your own. EDIT: you downloaded MY map and tried to pass it off as your own.